Piecing together fragments. Black Swans. Michelangelo’s Pieta. Our brains are wired through history, economics, and the frailties of human nature for narrative, not statistical uncertainty. The complex things we don’t and most importantly, can’t know in this world. Narrative tension is primarily about withholding information. Last night there was the Rick Steeve’s show on PBS about his trip to Florence, Italy. It is my favorite city in the world. One November day I got to view one of Michelangelo’s Pieta in a building located behind the Duomo. I got to view the The Pieta Bandini, Michelangelo’s final Pieta alone in the Duomo Museum, with a security guard. And with the one young woman who came through in the 45 minutes I was there, who had stopped in for maybe 5 minutes. God is dead in the Pieta Bandini. This was said to be a self-portrait of Michelangelo. That Joseph of Arimethea likeness. At one point, it is said, the 80-year old artist had wanted to destroy this piece of marble. And he did. This was a piece of sculpture that he had worked on toward the end of his life. Intending it as his own funerary monument. Eight years. It took him that long to discover an impurity in the marble? Eight years of tireless work, working between 1547 and 1553 on a piece of marble to depict the end scene when God in Jesus of Nazareth was dead, until finally discovering a flaw. Marriages ended in less time these days. So what had he set out to say in this piece of art? Why this moment in history? When Michelangelo was an old man himself. This was going to be his closing argument? Why this moment in history at the end of Michelangelo’s own life? Why this scene? Wired for narrative. Was this a glimpse into the way Michelangelo prayed? At the end of his own life? The Pieta Bandini: unfinished, like Michelangelo himself? And the artist tried to abandon the sculpture. This self-portrait. And it seemed appropriate, since 24 of 42 pieces of Michelangelo’s work are said to be unfinished. All of the figures looked unfinished to me, except that of Jesus of Nazareth and that of Joseph of Arimethea, in this self-portrait. It is said that the chisel marks demonstrate the unfinished nature of the work. A real self-portrait. When most of the sculpture conveys a reality, you can get up close and see the size of the hand of Joseph of Arimethea on the posterior aspect of the sculpture, in perspective, bigger in size than any human hand. Then there is the size of Mary Magdalene. She is a midget, for all practical purposes. And until the next chapter of this story, for all practical purposes, she had been. In the life of the Messiah. Sorry, Dan Brown. Joseph of Arimethea in the sculpture appears as large as Jesus. The blasphemy of self-importance, as he is larger than the two Marys, the Madonna and Magdalen. Jesus is no doubt dead. And Joseph of Arimethea is left to provide most of the support to the body. Speaking of support of the body, it was ironically the broken leg of the marble which had caused Michelangelo to destroy his work. Feeling isolated? Alone? With a hood on like a modern urban gangster. Had he really worked this piece of rock before he smashed it in 1555, because one leg of Jesus had broken off and because the block of marble was defective? Or was he questioning how he had spent his life? In this self-portrait? The blasphemy of self-importance. The broken. The defect in the marble. God. His son. Ever since reading that Jack Miles’ book, I have thought of the growth of God over time. What has He learned with each generation of people? It is taught that God had no beginning. And Jack Miles had written about the years that God had spent in solitude. Alone. God, dealing with His greatness. Alone. At the end of his life, so the Messiah. Pretty much alone. Except for these people depicted by Michelangelo. This masterpiece says a lot to me about those creatures formed in his image and likeness. About all of us. Alone. Michelangelo? Broken? The inward signs of our addictions. That no one else really knows. The movement in the story. Fragmented into solitude until we were all estranged, to different degrees. A Broken People. All of Christianity. This fragmented Christianity. The broken. The printing press and the Gutenberg Bible. The type writers. As more and more people became aware of God. And thought that they knew Him. Better than the next guy or gal. And so the 10,000 or 20,000 different denominations of Christianity began. Just like the different denominations of Judaism. With a lot more fragmentations. Piecing together fragments. Our brains were wired for narrative. Black Swans were not supposed to appear. Rare events. This focus on only the now. “The Black Swan Test” amidst these economic times. One definition of “depression” involves the loss of vitality. The opposite of depression is not happiness but vitality. And so in this economy, as in the broken religions of the world, our brains are wired for narrative, not statistical uncertainty, through history, economics, and the frailties of human nature. When you are depressed, the past and the future are absorbed entirely by the present. Depression was nothing except a mourning for our past. Art that stayed with us. Like the marble. The stress. The defenses. The reaction. The broken fragmentations. Art that stayed with us. The outward signs that were not one day events. The nuptials. The ordained. Those signs which kept bringing meaning, day after day. The confirmed. The forgiven. The Word. The ongoing sacraments. When economies were shattered. Art. The outward signs which strengthen us in holiness. The broken art. Kyrie eléison. The Word, the bread, the sacraments. The blasphemy of self-importance, in the present time. But when I was all that was left. When Jesus was no longer visible to half the world. To feed the hungry. To clothe the naked. And to heal the sick. The blasphemy of self-importance. 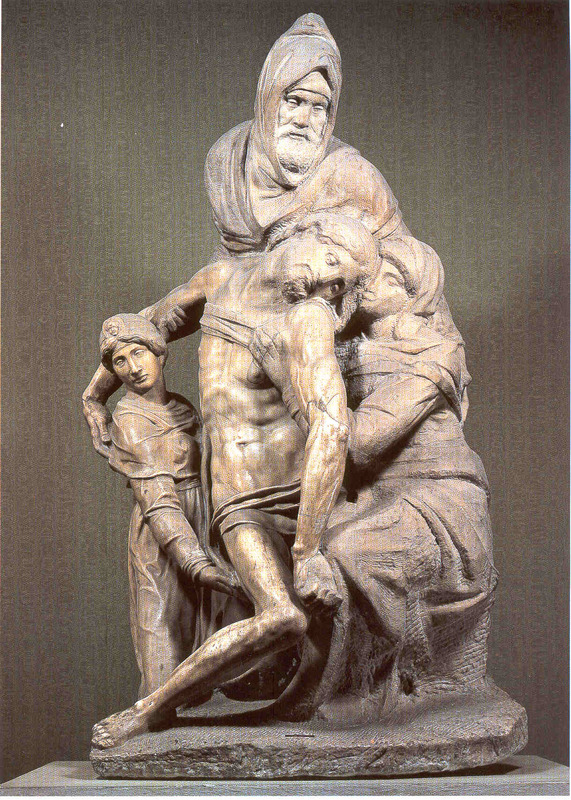 When Joseph in the sculpture appears as large as Jesus, when he is left to provide most of the support to the body. But in old age, with a loss of vitality. Looking for the outward signs. In art which unite us all again. Our brains are wired for narrative. The complex thing I can’t seem to know in this world. Not in 5 minutes or 45 minutes, in the Duomo Museum. Piecing together broken fragments. Rare events. To miss the reality in the present. Today. Piecing together fragments. Missing the black swan. You feel ashamed discussing the black swan in public, because black swans just did not happen in the real world. Of business. The blasphemy of self-importance. An artist wanting to destroy his own creation. The symbolism in trying to destroy self-portraits. Hoping for perfection when there was no such human thing. When masterpieces seemed to make no real difference. After pouring 8 years into one. Or thirty-three. The reality of Michelangelo. Coming to realize, in the art, the godliness of a Messiah. In the narrative tension of economic chaos. In panics. In the reality of a piece of art. Powerless in the end. With some unknown student piecing together broken fragments. Like Joseph of Arimathea. Recognizing the Masterpiece. I wasn’t gonna look at that Rick Steeve show last night. I had already been there. I had thought I had seen all that. The complex thing we don’t and most importantly, can’t know in this world. Piecing together fragments of some kind of sacred monument. If there ever had been a black swan. Someone had gone ahead and pieced together the broken fragments, so that this Pieta was still viewable. Technorati: “Remember all that talk about living in a time when paper no longer mattered? In our on-demand digital world, a majority of us are growing more comfortable at managing and receiving our personal data online. Not to mention that the omnipresent Cloud is making it easier than ever before to locate all of your data in one secure, encrypted, and centralized depot. New problems arise, however, with all of the merchants you do business with and having to keep track of all of your electronic bills and transactions via the merchant’s website.